Sometimes, you realise that this upcoming weekend you really really need an easy, straightforward sewing project to keep you occupied. Like for example when you, due to absolutely no dangerous reason have itchy stitches in your face that you can't scratch, for example. And sometimes, at such a time, you might have reason to expand your 12th- to early 14th century wardrobe for LARP reasons, and you just might vaguely remember that once, like seven-ish years ago, you found a wool curtain in a Charity shop, and that you, like four years ago, decided to try to make something out of it, just because. And that you then cut the pieces and that a more urgent project got in the way, and the whole thing was forgotten, and stuffed into a box in the basement, and then you moved, but it's still in that box somewhere. And then you go look for it and yes, it's still there, all the cut pieces. And it happens to be red, which is the theme of the challenge for the month. And that's when you make a gardecorps. Apparently. A "gardecorps" seems to be a very loose term. 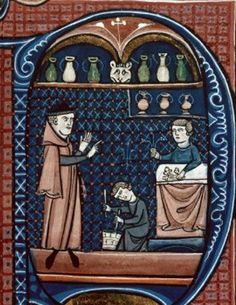 Once you outwit Google, the images appears in abundance - both images from the time, and reconstructions. I'm in no way an expert, but I'd say that a gardecorps typically as loose over-garment, worn by both men and women. The sleeves are often over-sizes and/or extra long, and either have openings or are only semi-attached to the shoulder-seem. 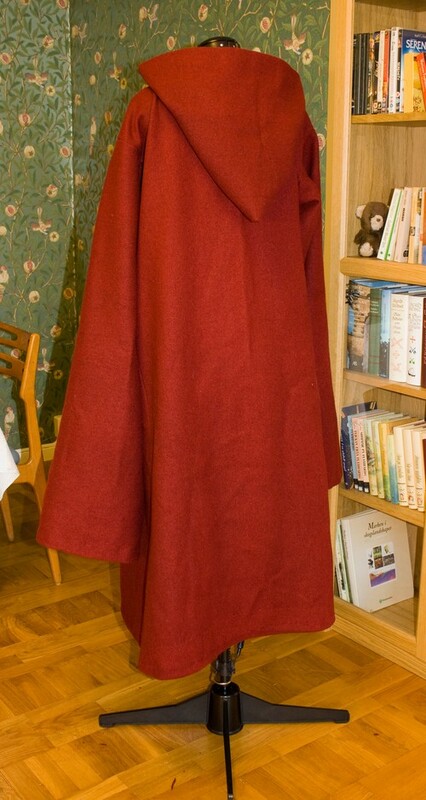 Often, it has a hood, and often, it's longer than knee-length. 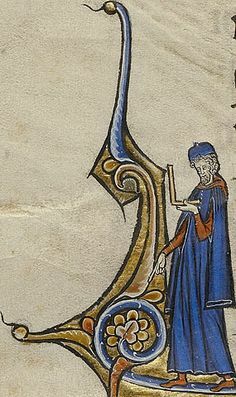 Second half of the 13th century: Canon de la médecine, Avicenne, 1250-1300, Paris. 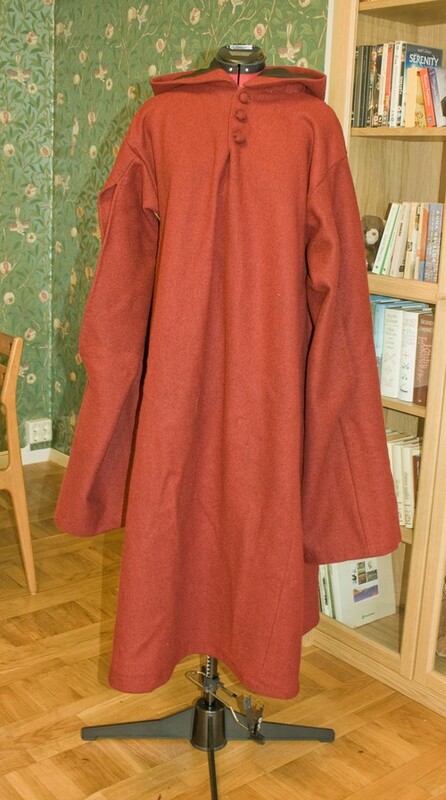 Loose garment, has hood, sleeves likely only semi-attached (though a slit is also a possibility). Marquette Bible, Franco-Flemish, probably Lille, about 1270: Sleeves oversized and extra long, slit in front for arm, visible closure at the top. My guess would be an attached hood with the lining showing - could of course also be a separate hood. 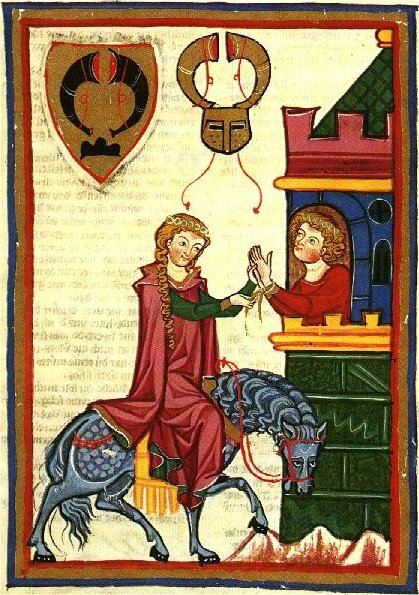 The Codex Manesse, first half of 14th century. A gardecorps on a woman, this time. 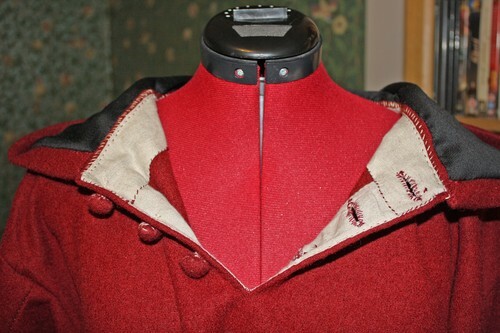 The hood could be very large, creating the folds over her shoulders, or be a separate hood. 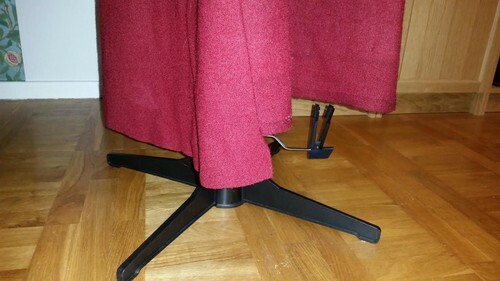 Again, the sleeves seems to be semi-attached. Yes. That is the selvedge. You know, the thing you normally look at to get a reasonably straigt edge. Here: not so much. This is the piece that would eventually be the hood. Rectangular front and back pieces, one gore in each side (both pieced, though I can't remember why) and long sleeves in rectangular shape. All wrinkly from being in a box for four years. I took all pins out (only seams were the seam in the middle of each gore), pressed it to a less wrinkly shape and sew the pieces of the body of the garment together. 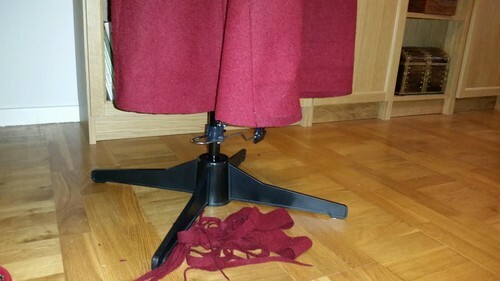 Then, I took a possible shortcut, and turned the sleeve until the seam was where I wanted the slit to be, sew the sleeve-seam but left an opening/slit where I wanted to have it, and then attached the sleeve to the garment. 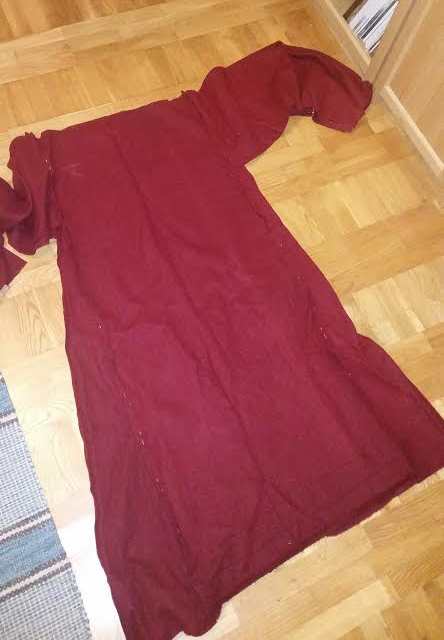 I then cut the neck-opening slightly rounded, with a slit in front, and added a linen facing all the way round. I made buttons from scraps of fabric (due to the fabric being thick and stiff the buttons had to be larger than I normally like), and made buttonholes. It wasn't yesterday I made buttons and buttonholes. I could have placed the buttons closer to/on the edge, it would have been better and maybe I move them later, but for now it will do. The finished result: Hood lined in thin, black wool - really too nice to waste on a garment made out of old curtains, but I needed something thin and soft for the hood to drape the way I wanted it to, so rather than getting new fabric, I made myself stick to what I had in my stash. 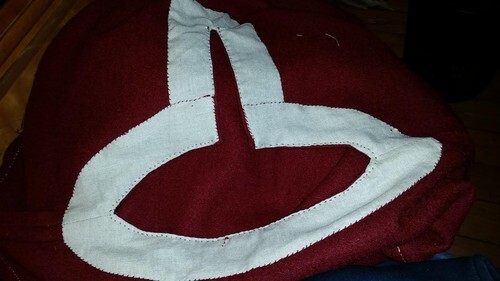 The hood and garment is made separately, and then basted together with waxed linen thread. 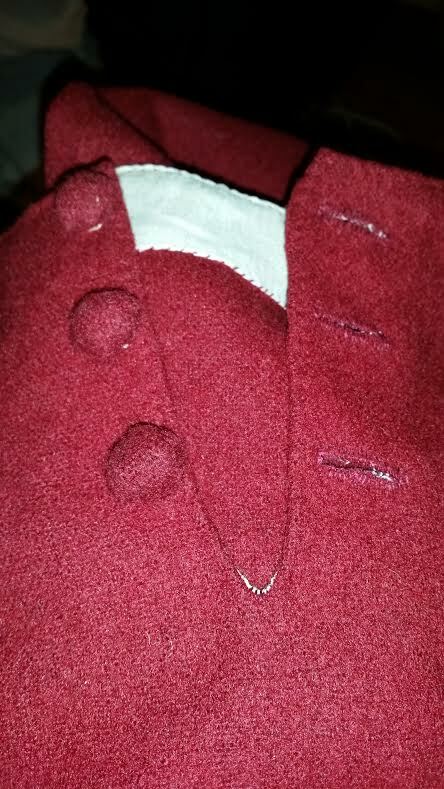 (I used black silk thread for the lining of the hood and, lacking silk in other colours than black, red cotton(?) embroidery thread for buttonholes and other visible seams.) The end result looks fairly neat, if I may say so myself. Did I mention that "straight grain" wasn't really a thing with this fabric? This is what happens when the fabric is like that. And one is me. The combination is not a match made in heaven. Not something that a pair of scissors can't solve, though. The finished garment: backside. 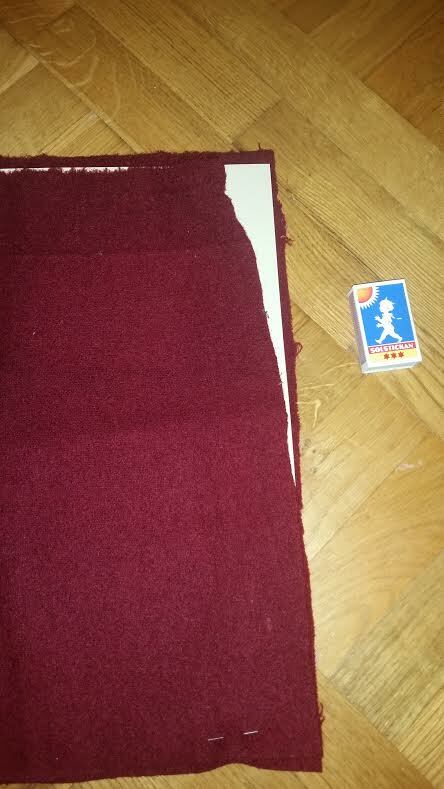 I might go back and fix a bit more on the inside of the hem, it's sloppy now with raw edges showing, but... later. In the end, I was four days late, but I'm still happy - didn't think I'd manage this challenge at all, and it's not too bad for three days' work. All handsewn. The red has a lot more blue in it in reality - my camera LOVES red, and adds a vibrant red to photos whenever it can. The Challenge: Red (Make something in any shade of red: Check!) Could also fit the travel challenge, but the Red challenge is closer in time. Hours to complete: Not sure, lost count. But 2-3 days in total I think. First worn: Not yet, likey will wear it in mid January 2017. Total cost: The wool is a charity shop find, the thin wool for lining was a clearance sale bargain, the linen's so tiny pieces that it hardly counts. Including notions, perhaps about 10-15 euros in total. Probably closer to 10. I'm feeling very thrifty for once.